When I went to Nevada in December, my best friend’s daughter made me a fabulous hot drink. It was Chai tea with pumpkin spice creamer. I had never tried Chai before and fell in love with it! 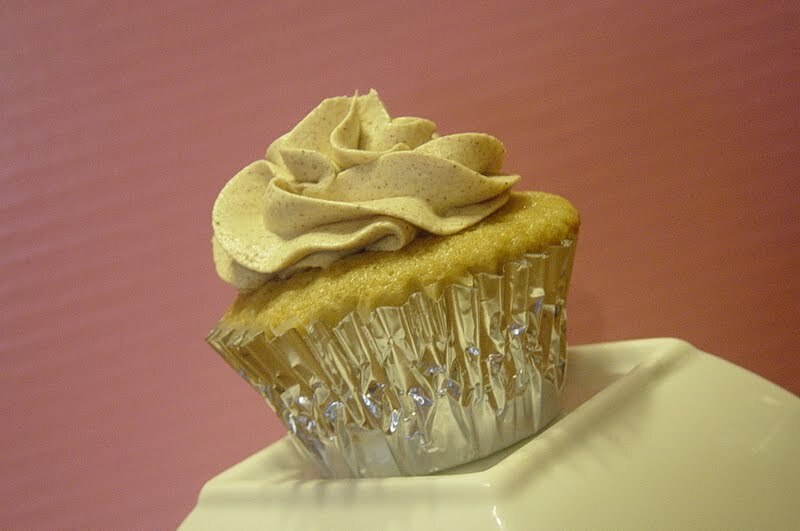 As I was brainstorming cupcake flavors to invent, I instantly thought of a Chai cupcake with pumpkin spice frosting. Here’s what I came up with. Let me know what you think! (the frosting is a twist on the Perfect Cupcake Frosting recipe from Our Best Bites). Sift together the flour, baking powder, salt, and dry Chai mix in medium bowl. Set aside. In separate bowl, or measuring cup, mix together milk and liquid Chai concentrate. Set aside. In large bowl, preferably a bowl to an electric mixer, beat together butter, sour cream, and sugar until smooth. Add one egg at a time, beating until well incorporated. Add the flour in three additions, alternating with the milk mixture. Be sure to start and end with the flour mixture. Do not over beat! Divide the batter among paper lined muffin tins. Fill each paper 3/4 full. Bake at 350 for 20 minutes or until toothpick inserted in center comes out clean. This recipe makes approximately 2 dozen cupcakes. Whisk together the flour, creamer, and milk. Heat in a small sauce pan on medium heat. Whisk continuously until it starts to thicken. Let it cook, while stirring, until you can start to see the bottom of the pan. Place the mixture in a mesh strainer and stir with a rubber spatula to push it through. You should end up with a nice, smooth mixture. It’s almost like pudding before it’s set. Put this mixture in the fridge and let it cool completely, it’s fine if it stays in there long enough to get chilly, you just don’t want it warm at all. When it is chilled, you can move on to the following step. In an electric stand mixer, beat the butter, sugar, and pumpkin pie spice for a minute or two until well combined and fluffy. You’ll want to use the whisk attachment on a stand mixer, not the flat paddle. Then while beating, add in the thickened milk mixture and the vanilla. Beat to combine and then scrape down the sides. Beat on med-high for 7-8 minutes. ENJOY! For more of Tiff's work, visit bettycrockerwannabe.com.